This post follows on from my previous three (most recent first in list) linked below. There is no doubt that in just a short time from now we will probably see a 'one-click' installer to by-pass the next steps but a least this method allows you to change 'in/out' the individual libraries if there is are updates using the usual 'sudo apt update && sudo apt upgrade'. 1. 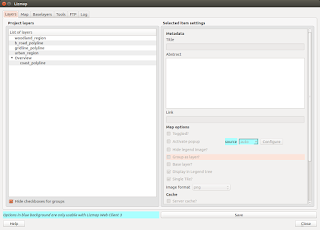 Firstly...Create a new QGIS project, add your layers from PostGIS, Shapefiles or raster (geotiff), style and symbolise those layers, set the projection and ensure you've set up your 'OWS Server' in 'Project Properties'. 2. Let's install the 'Lizmap' Plugin first by going into the 'Plugins' menu then 'Manage and Install Plugins', then type in 'Lizmap' in the Search bar. 3. 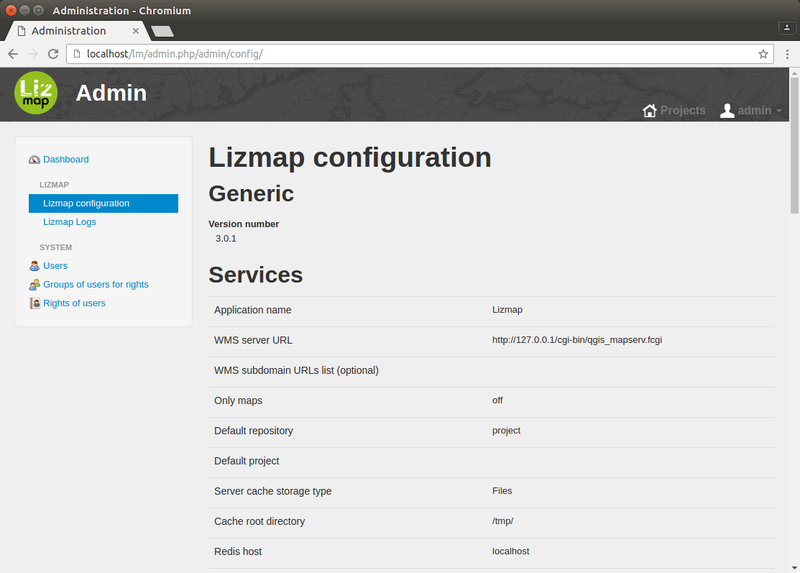 Tick the 'Lizmap' plugin and 'Install'. 4. Go back to 'Project Properties' and in the 'General' tab ensure 'save path' is now set to 'relative'. 5. 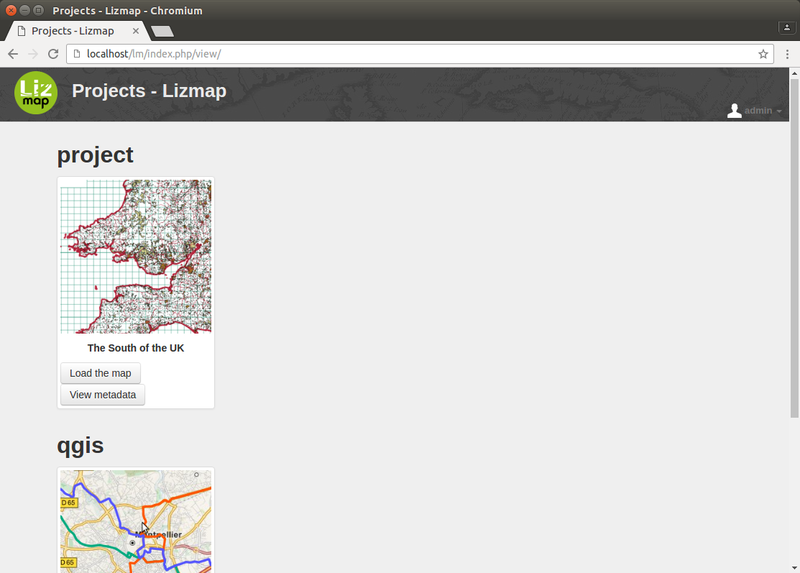 Next... click on 'Lizmap' under the 'web' menu and set all the tabs similar to below. 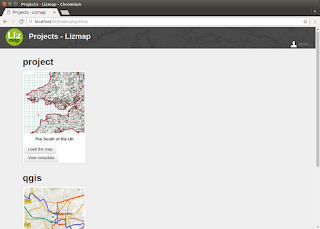 Your choices here will activate the relevant tools in the browser when we get to the lizmap-web-client later. Your layer/s should already be showing in the list. Now click on the 'Map' tab and tick the 'map tools' that you want in your map browser. Set the scales you need separated with a comma (integer's only). You can set the 'Initial map extent' to the 'map canvas' option. Then we move onto the 'baselayers' tab. Set as many map options as you like. Next the 'Tools' tab. In here i would just worry about adding your attribute layers in the bottom block (below). We can miss on the 'FTP' tab because this is no longer used. In the 'Log' tab (below) you just need to click 'Save' and read the generated log to ensure it is successful. Once you 'Save' in the 'Lizmap' plugin a file with the same name as your project file e.g. 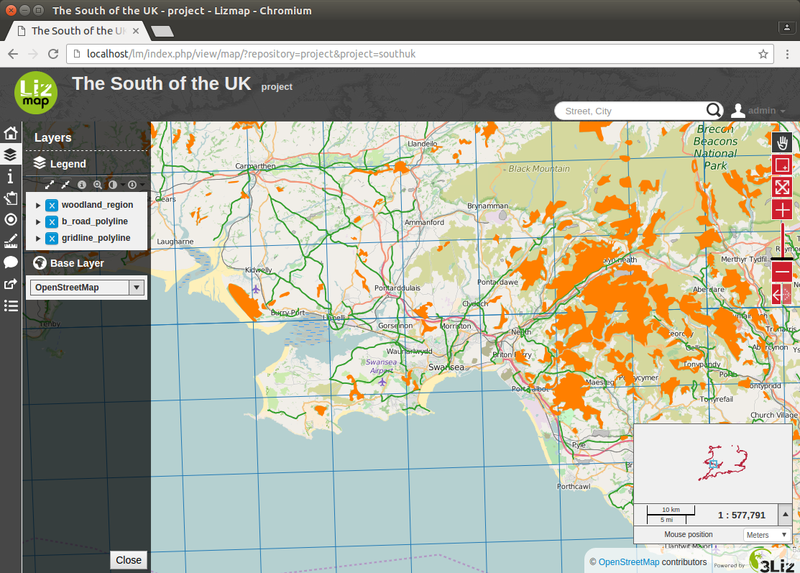 'southuk.qgs.cfg' this will now go with your qgis project file to be saved in '/home/some_directory/southuk.qgs'. Click on 'Branch Master' and in the dropdown select 'release_3_0' the repository will now change to the files in the '_3_0' release. 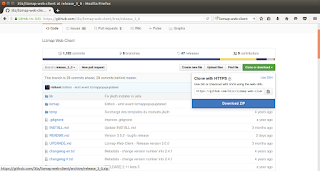 Click 'clone or download' then 'Download ZIP'. Extract the ZIP file into any folder. 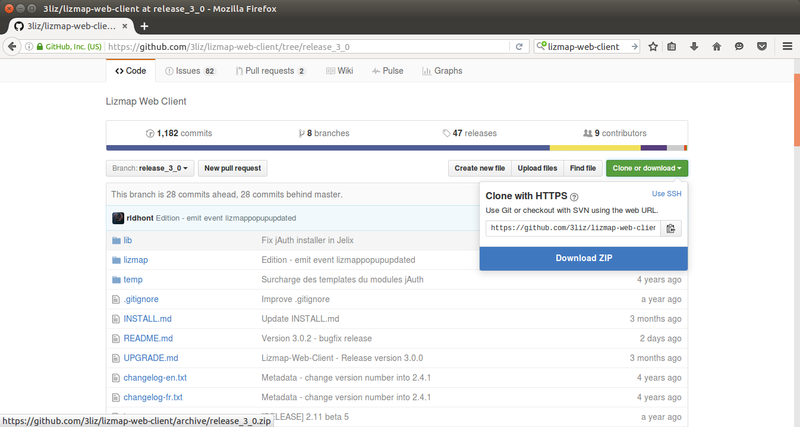 You now have a folder entitled 'lizmap-web-client-release_3_0' now we need to move it onto our Apache2 Server folder. 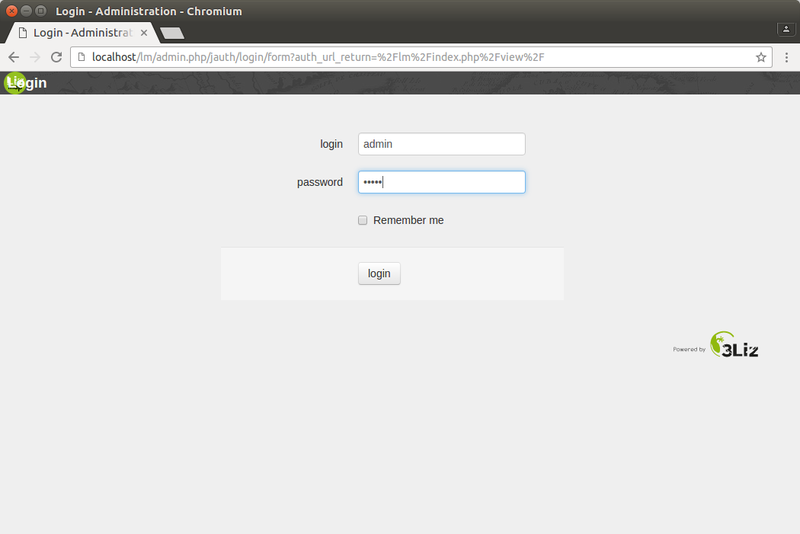 'Exit' Nautilus when done on the command line. 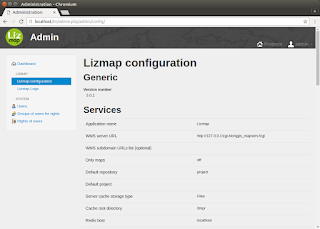 Now we link the lizmap client into the apache2 server 'html' directory so it is available in a standard browser a little later on. 8. 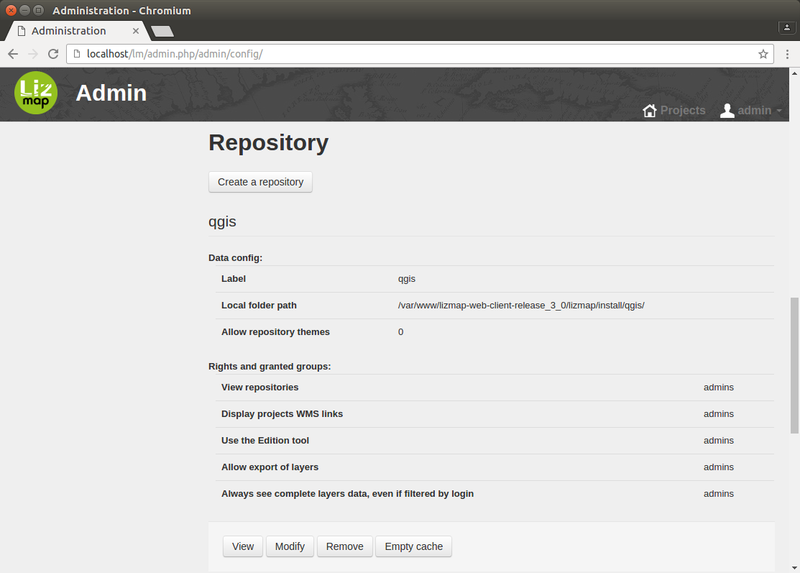 You need to enable the QGIS 'Demo' repository. 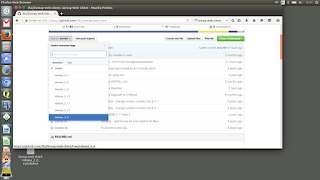 ** At this point it may be that you want to use the Lizmap web client directly on a production server, in which case you would need the installation of some extra php modules necessary for production. If so i recommend following the instruction in the following reference. The is an image taken from my project in QGIS named 'southuk.qgs.png' which is used as the 'thumbnail' image in the Lizmap Web Client also added to the folder. 11. If you click on the 'Connect' button on the top right corner you will be asked for login details in which you can enter 'admin' as 'login' and as 'password'. 12. Go back to the top right corner and click on the 'admin' button and select 'My account' and click on 'Lizmap configuration' in the left hand list as below. This shows your pre-set services. Set all the 'rights' to 'admins' for now. 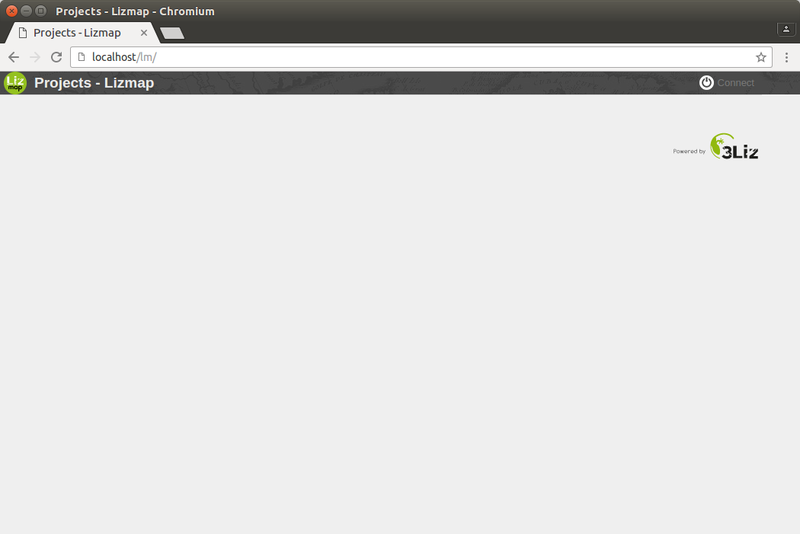 If all goes well when you click on 'View' you should see the project as a thumbnail image. ** It's important to remember the last '/' at the end of the folder path location. If all goes well when you select the 'Project' button (top right) you should see your two projects listed one under the other. 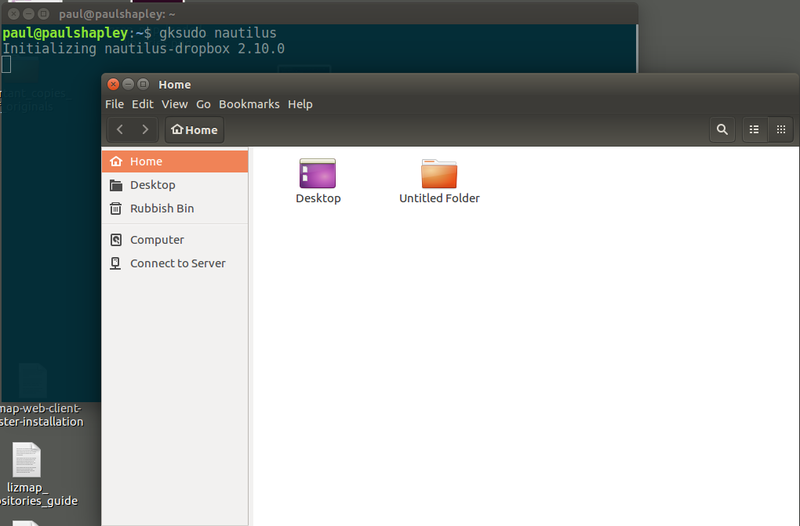 Both 'Repositories' should be showing if you've set the 'local folders' correctly and 'saved' without any errors. 15. Just click on one of the Projects and you go into your map view. 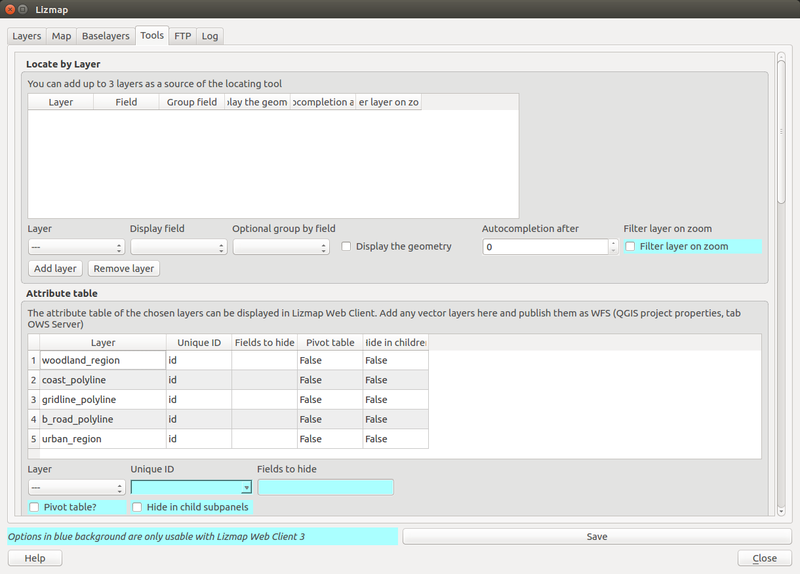 Now you can see that your layers are the same as in QGIS project. 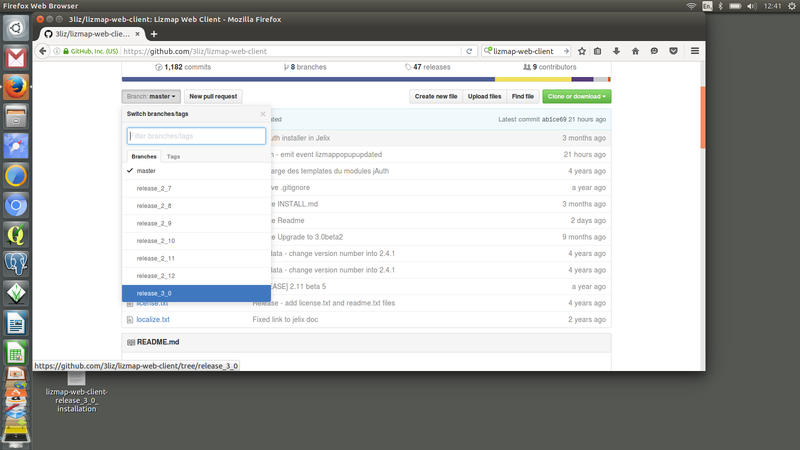 If you make any changes in your project file and save it... simply refresh the browser for the changes to update on your web map. 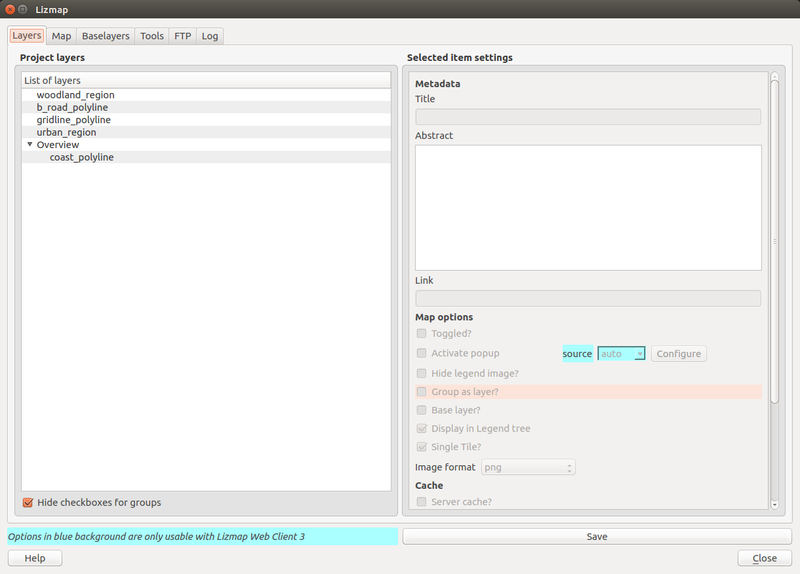 Go on...experiment, change some themes in your qgis project and see the changes when you refresh your browser. You can for example create a group of layers to appear in the 'Overview' Map in the bottom right corner. Please email me if you need help installing the client or any other questions. Article useful, but it is not the strength of my abilities. I specialize in project work, namely the creation and management of projects. 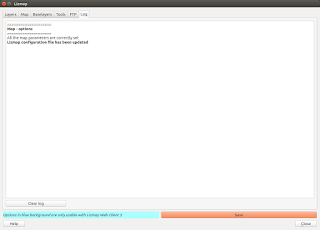 Last time doing projects that are closely associated with php development. I once did this success, but this time I decided to turn to a professional team php developer outsource. I was amazed at how quickly and accurately they have completed their work. They are ahead of schedule, and thus free up time for my vacation. Great tips to become a better web Developer! I have to share this post on my facebook wall to see my friends. I hope they will get some impressive information through this reading. By the way, I am a big fan of Reztech web developing company. Thanks! 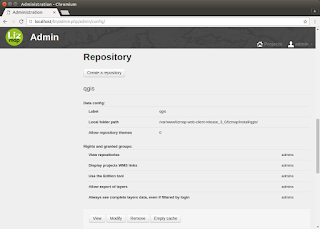 Your four articles about QGIS server and Lizmap are very useful. Unfortunately, I have real trouble installing and configuring Lizmap Web Client; I think this is about php and apache configuration and it's not exactly my stuff... Where can I send you a message for a little help? Thank you. Cécile, Paris. you done a great work,I’m really impressed with your article, such great & usefull knowledge you mentioned here. CCNA Training Institute in Chennai | CCNA Training Institute in Velachery. Very beautiful blog. keep sharing more posts... Web Designing Training Institute in Chennai | Web Designing Training in Velachery. Very interesting and Helpful Tips…..Thanks For Sharing. Really Nice Blog.....Thanks for sharing .. 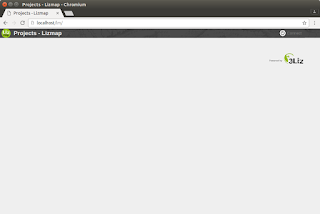 Thanks for sharing this useful Blog.. Thanks for sharing your informative post.. Web Designing Training Institutes in Chennai | Web Designing Training Institutes in Velachery. Thanks for your input. I really appreciate your effort. I really impressed your article.. 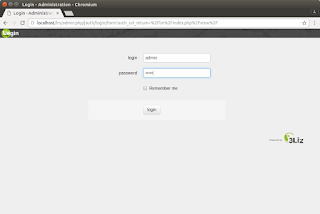 Your creating some web client technology..keep updating your post..
Great info. The Qgis server installation steps are very precise and clear. Easily understandable. Thanks for sharing and keep updating.. Very nice post..Thanks for your input. I really appreciate your effort. Keep sharing. what a fantastic post to sharing..I really like that post.. In this article you shared information about web marketing is very effective for learners. I have got some important suggestions from it. Your blog was explain everything in detailed manner and it was very interesting to read. Kindly keep updating such a nice blog. This article gave good information.Thank you for posting this article. 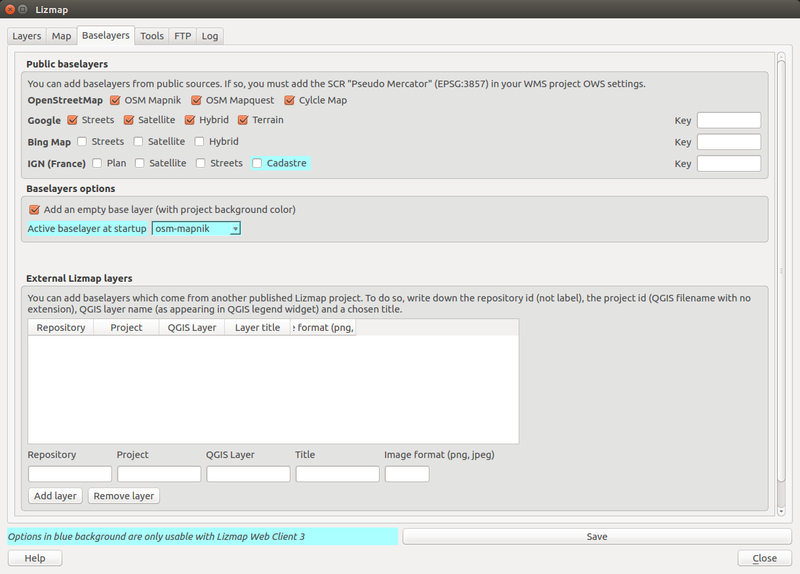 very usefull blog about installing the QGIS Lizmap Plugin & Lizmap Web Client. thanks for sharing. Hi, I am really happy to found such a helpful and fascinating post that is written in well manner. Thanks for sharing such an informative post. keep update your blog. The information shared is very much helpful Thanks for sharing it. Nice Article. Keep updates. Best Regards. It’s very informative and useful blog. You have done really great job. Keep update your blog. Thanks..
Great Post! Good Explanation. I like the way you described this useful content. The information shared is very much helpful.Thanks for sharing it. Really a very nice blog i really appreciate all your effort, thank you so much for sharing..
It’s very informative and useful.Keep update your blog. Thanks..
Really great blog, it's very helpful and has great knowledgeable information.Thanks for the nice information.. This is very good article that i gained more information..Thank you..
content of different kinds of the valuable information's. Wonderful post..You described more information about the technology that is very useful..Thanks.. Excellent post which gives more information and very useful.. This is Wonderful post..You described more information about the technology..this is very useful..Thanks.. This article is awesome.This is really helpful for me.I liked this blog.I am a regular follower of your blog.This is really very informative post.You shared great information.Keep updating blog.Thanks. This is great looks of collection.I loved this information you shared.Thanks for this shared information.Keep updating. The concept taken here will be useful for my future programs and I will surely implement them in my study. Keep blogging article like this. You provided good information.This is very useful for me.Thanks for sharing this information.Keep updating. Thanks for your article. It is very useful for us. It is a one of the great discussion which is very essential for me as well. Wonderful blog!!! I would like to share with my colleagues and friends. Really very informative post you shared about the server technology. Good Post…. Thanks for this useful information it’s very useful to read your blog. Keep blogging article like this.